Fleming Construction » Blog Archive » How do Solar Panels work? The sun is the source of solar energy. Visible (you can see) and ultra-violet (you can’t see) rays produce electricity in your solar panels. Silicon in the panels releases electrons. These electrons are collected to form direct current electricity (DC). The inverter in your system converts the DC electricity to AC power that you can use. A photovoltaic system works best on clear, sunny day, when the sun is more directly angled above the panels. Cloudy days and evenings produce little to no power. Photovoltaic systems are best used in the summer, when the chances of optimal use are best because of longer days and the sun’s position in the sky. Solar power is produced by photovoltaic panels, which are assembled from solar cells and are made of semi-conductors. When exposed to sunlight, these cells produce electrical current by causing electrons to travel across the layers (one positive and one negative) of semiconductor material. These cells are attached to the roof of your structure using frames which are composed of aluminum and stainless steel units. The main electrical panel of your home is where the power output from your inverter will be located. For the photovoltaic system, you will need a dedicated circuit breaker. A backup battery option is available, which will give you power during an outage. This requires a separate and new electrical panel for essential household circuits. All of your non-essential circuits, those you do not need during an outage, will remain on your existing electrical panel. Power outages can be dealt with simply by installing batteries in your system. These batteries provide AC power, which is produced by your inverter when necessary. During times of normal operation, these batteries are recharged by your solar panels. Batteries add additional functionality to your overall system and operate independently of your utility grid; however, keep in mind that state rebates may not be offered with this option unless your batteries are connected to your utility grid. Many rooftops can be adapted for the placement of your solar system; however, a south to southwest facing roof provides the best location for optimum performance. Flat roof lines work well with these types of systems, and your panels can be tilted at a 30 degree angle to maximize your rebate incentive. If we find that your rooftop will not work with a solar system, we can install trellis work or ground anchored racks to house your system. 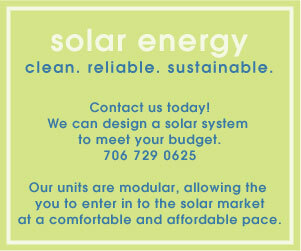 Each kilowatt of photovoltaic needs about 100 square feet of open, unobstructed space. You can determine the needs of your photovoltaic system by determining how much electricity you are currently using and by deciding what percentage of electricity you would like your system to supply.